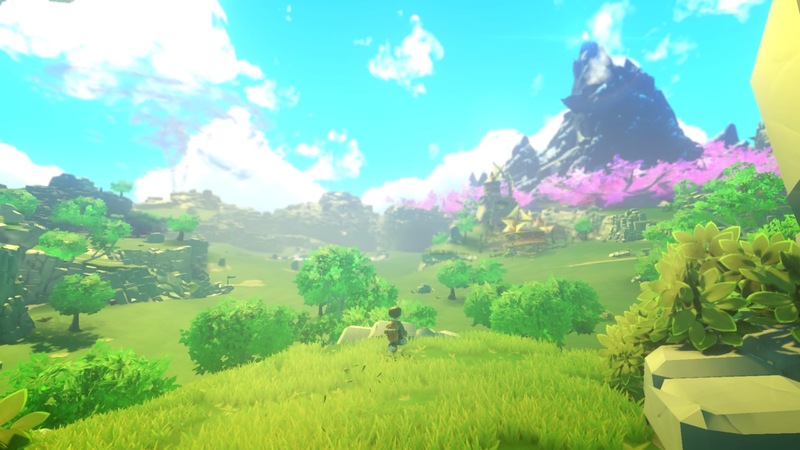 To many people, Yonder: The Cloud Catcher Chronicles might look like your standard open-world adventure. 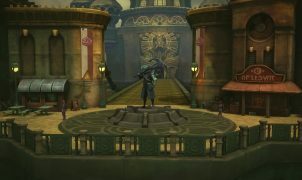 It boasts plenty of places to explore, a myriad of quests to complete, and, most importantly, character customization. If you look a bit closer however, you’ll notice that something is missing. 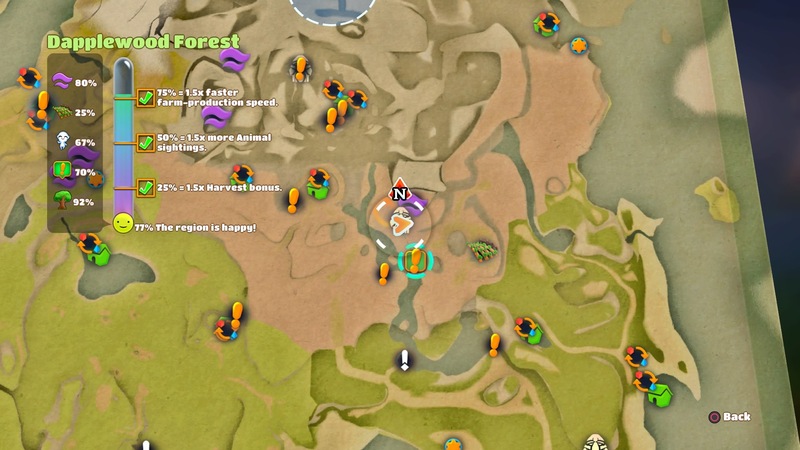 Something that most games like Yonder feature plenty of… Combat. No, you didn’t read that incorrectly, Yonder is a fully functioning, open-world adventure that is, among many other things, completely devoid of combat. “Say it ain’t so!” some of you are surely muttering to yourselves. After all, how can you go on an epic, world-saving quest without slaying hordes of bad guys? …Is that even possible? As a matter of fact, it is. And here’s the kicker — it’s fun. 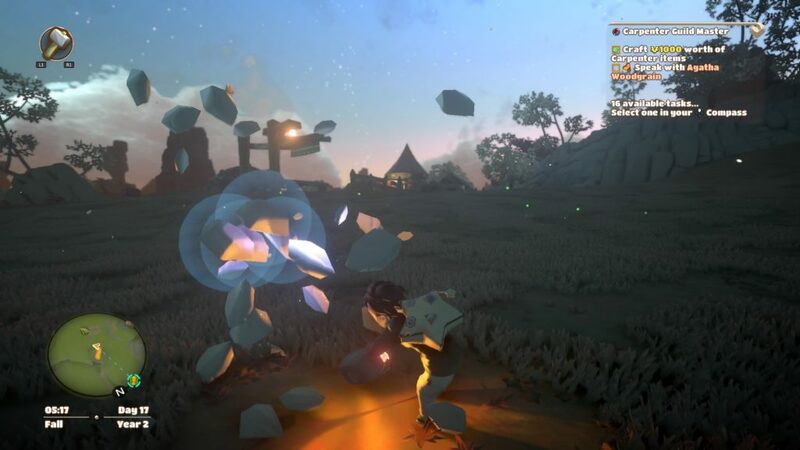 Yonder: The Cloud Catcher Chronicles proves that swinging a sword around isn’t the only way to save the world (granted, that’s still fun to do). Yonder begins with the protagonist and a motley band of sailors out on the high seas. Guided by (what I assume is) an old letter and their magical, Celestial Compass, the player has set sail for Gemea — the land in which they were born, but mysteriously sent away from. Unfortunately, the trip isn’t all quite smooth sailing (hah!). As they approach Gemea, the ship is hit by a terrible storm. Unable to weather (hah, again!) what nature has thrown at them, the ship eventually meets an early demise — sending its crew tumbling across the sea. Well, this isn’t the worst place to crash. While the player is drifting in and out of consciousness (man, I am on fire with these puns today), they are greeted in their dreams by Aaerie — a once proud and strong guardian of Gemea — who assures them that both they and the rest of their crew is safe. She continues, warning them of the Murk — a dark, impenetrable mist — that has spread across Gemea, and telling them that the safety of their homeland is now in their hands. After waking up and going through a short tutorial, it’s your call what to do next. 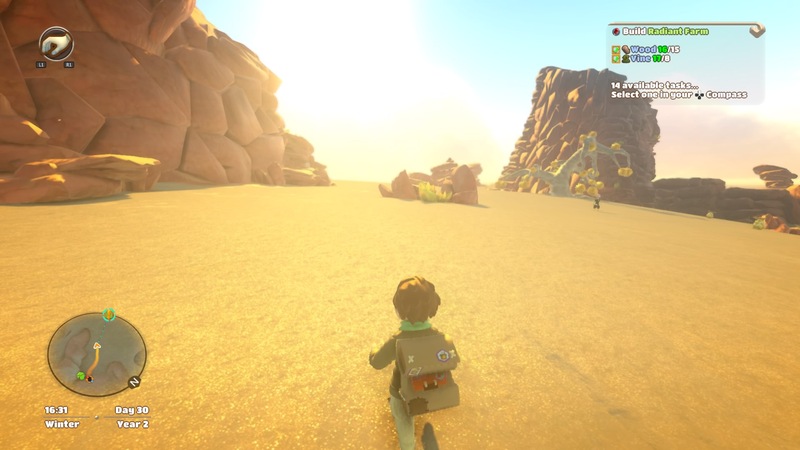 Despite the foreboding narrative in the beginning, Yonder is rather light on the story. In fact, it’s easy to forget why you’re in Gemea in the first place. The entirety of the game focuses on you, the player, and does so in a very “here-and-now” way. Sure, you’re basically there because it’s destiny. And sure, story-wise, time is of the essence. But Yonder never makes you feel like you have to rush through the story. In fact, the game is rather short if that’s all you’re focusing on. I said it before, but I’m going to reiterate — there’s no combat in this game. No stabbing, no shooting, nothing. So, what’s there to do instead? Quite a bit, actually! First and foremost, there’s exploration. After all, it wouldn’t do an open-world game much good to… you know… not have an open world. But hey, that isn’t a problem here! The massive island of Gemea features eight different climates, each of which come with different flora and fauna to seek out. The game also features a day/night system, various weather conditions, and even an entire calendar year (about 30 days in-game), with distinct seasons. 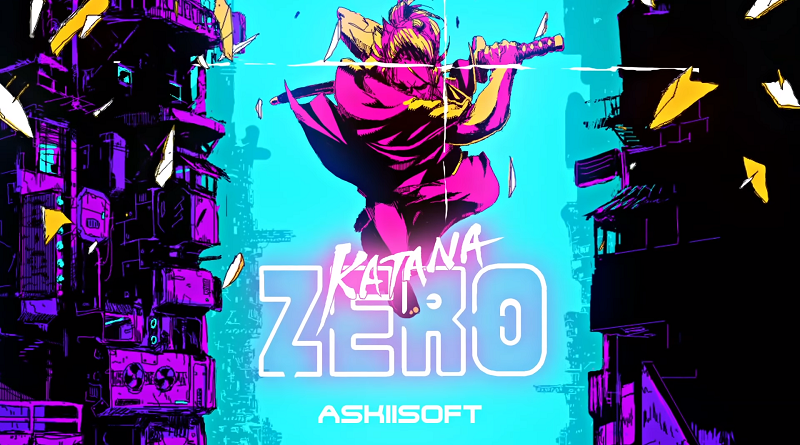 If you’re a fan of games with good aesthetics, then you probably won’t want to miss out on this. You never know what (or who) you might find when wandering around! There are plenty of things to be on the look out for, but two especially important things are Sprites and Murk. Murk as I said earlier, is a kind of dark, impenetrable mist. Rather than blanketing the entirety of Gemea however, it is concentrated in small spots around the continent. Murk can be dispelled, but only through the use of Sprites — magical, fairy-like creatures living throughout Gemea. Each Murk spot requires a certain number of Sprites to dispel it. Generally speaking, the further you are in the game, the more Sprites you’ll need. Many Murk spots hide optional areas, but a few of them are necessary to clear if you want to get through the entire game. Unfortunately, this is where we hit a small rough patch. Yonder has a lot of things going for it — day/night cycles, weather, seasons, collectibles — and it’s all very pleasing to look at, but there isn’t a whole lot of discrepancy in terms of how things play out. Regardless of where you are, you’re pretty much doing the same thing. And don’t get me wrong — a lot of those things that you’re doing are enjoyable — but I was getting a “style over substance” vibe from how the game was set up. Sure, some of these things may have a slight impact on gameplay, but most of the time you’d actually have to be looking to spot any differences. Work hard, reap in rewards! I’d also like to note that the game tabs the player’s progress. When looking at the world map (which I actually didn’t know existed at first, whoops), you can see how well you’re doing in each area in regards to how many quests of you’ve completed, how much Murk you’ve dispelled, and the like. The more that you’ve done, the happier that area will be. And that happiness works in your favor, too. As you increase the happiness in each area, you’ll gain access to perks like more bountiful farm harvests and increased animal sightings. In the end, your hard work comes full-circle! Collecting and crafting items play a major role in Yonder. In fact, it comprises most of what you’ll be doing in the game. Although it may be suffering from a slight Murk problem, Gemea still has an abundance of natural materials available. And you can bet that you’ll be collecting as many of those materials as possible. From picking flowers, to mining ore, to chopping down trees (and planting new ones in their place! ), Yonder really turns your character into a jack-of-all-trades. Leave no stone unturned. Er… uncrushed? None of the work is particularly difficult to do, either. Material spots (trees, rocks, etc.) are very commonplace, and the game doesn’t require you to level up skills. All you actually need is the proper tool for the job, and the game hands all of those to you at the beginning. I found this setup to be both good and bad. On the bright side, you won’t be spending hours hunting for materials. As much as I can appreciate farming (both figuratively and literally) in games, I’ve got better things to do than sit there for 3 hours, mining the same ore spot over and over in hopes of getting that .001% rare drop. You also run into a diminished level of challenge, however. Going hand-in-hand with the “same-ness” that each area has in terms of what there is to do, is the fact that everything is essentially done in the same way. You go up to something, hit the same button a few times and continue on your way. I appreciate how whimsical this game is. Honestly. But having almost no challenge at all can make things somewhat dull. Oh, except for fishing. Fishing can be kind of tricky if you aren’t paying attention. Naturally, once you’ve picked your share of vines and smashed your share of rocks, you’re going to be crafting. 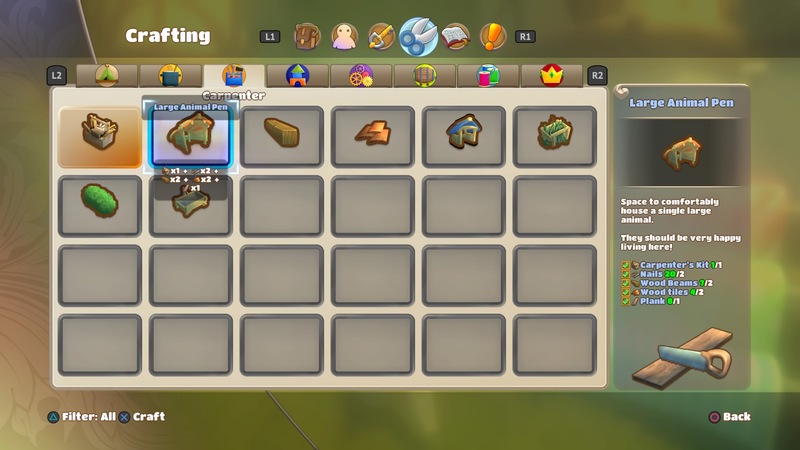 Yonder divvies up its crafting system into a number of sub-categories, such as brewing, tailoring, and so on. Each town in the game (save a handful) specializes in one of these crafts and, in order to learn the craft yourself, you’ll need to visit “craft masters” in each town, and complete a quest. These quests usually aren’t very hard, and you’re rewarded with a nice number of recipes, so it’s worth completing them. You can also upgrade from rookie to master after enough crafting, unlocking even more recipes. Crafting, for the most part, isn’t necessary, but making things (especially clothes) is a lot of fun, so I’d recommend not skipping out on anything. No open-world adventure is complete without strangers asking you for favors, so of course Yonder is on top of things when it comes to quests. As you journey throughout Gemea, you’ll undoubtedly run into its many citizens… most of whom need help. Joking subtitle aside, many of the quests do involve you needing to deliver an item, or a set of items, to an individual. Not all of them, though. That’s pretty much it, honestly. Another day, another farm built in the middle of a desert. On paper, a game full of fetch quests might sound dull. And to some of you out there, it might be. I know that I had a lot of fun with it, though. Most of the time, you’ll be doing whatever it is that you’re doing for a reason and, if not, you’ll at least get something in return. You may need to build a bridge, but are rewarded with a new place to explore. Maybe someone wants you to find their lost pet, but gives you some snazzy new duds for doing so. Yonder seems to realize that quests are one of its main sources of gameplay, and reacts appropriately by making sure to always reward you properly. Because of this, questing always remains enjoyable. After all, who doesn’t love getting awesome rewards for doing things? 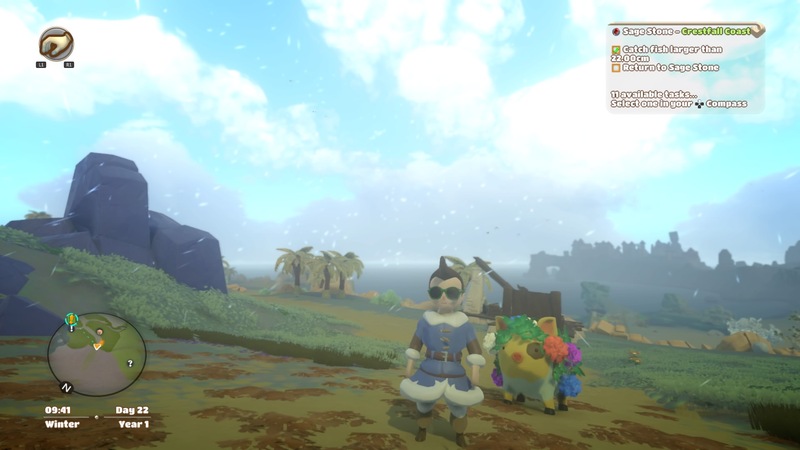 As far as open-world adventure games go, Yonder: The Cloud Catcher Chronicles is relatively solid. 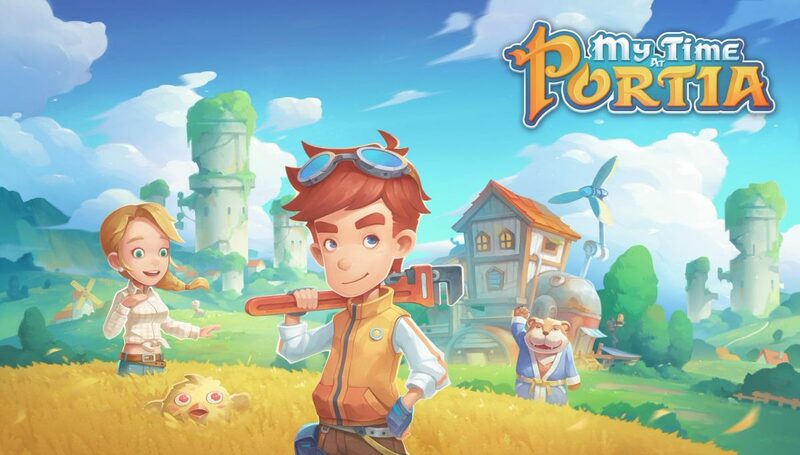 It features a large and varied world to explore, plenty of activities — like farming and crafting — to participate in, and enough quests to keep you busy for a while. And though it may suffer certain problems — like an overall lack of depth with the available activities, and areas whose largest change is in their visual aesthetics — I can confidently say that I enjoyed my time in Gemea. There’s something to take away from a game like Yonder, though; the fact that a game doesn’t have to be violent in order to be fun. More so, that an adventure game doesn’t require violence in order to be fun. Yonder wasn’t perfect, but the fact that it was Prideful Sloth’s first-ever game is very impressive. I eagerly look forward to what they come up with next.